[It] is possible to generalize somewhat about the psychodynamics of primary oral cultures, that is, of oral cultures untouched by writing. 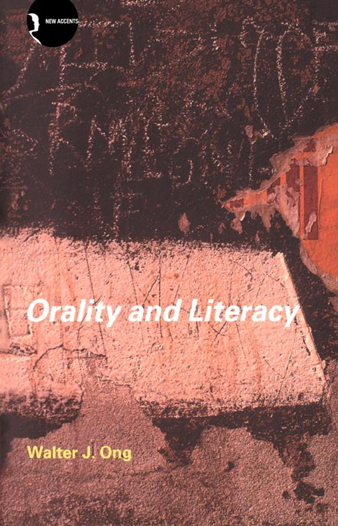 … Fully literate persons can only with great difficulty imagine what a primary oral culture is like, that is, a culture with no knowledge whatsoever of writing or even of the possibility of writing. Try to imagine a culture where no one has ever ‘looked up’ anything. In a primary oral culture, the expression ‘to look up something’ is an empty phrase: it would have no conceivable meaning. Without writing, words as such have no visual presence, even when the objects they represent are visual. They are sounds. You might ‘call’ them back—’recall’ them. But there is nowhere to ‘look’ for them. They have no focus and no trace (a visual metaphor, showing dependency on writing), not even a trajectory. They are occurrences, events. In a primary oral culture, thought and expression tend to be of the following sorts. In the beginning, when God created the heavens and the earth, the earth was a formless wasteland, and darkness covered the abyss, while a mighty wind swept over the waters. Then God said, ‘Let there be light’, and there was light. God saw how good the light was. God then separated the light from the darkness. God called the light ‘day’ and the darkness he called ‘night’. Thus evening came, and morning followed – the first day. Thought requires some sort of continuity. Writing establishes in the text a ‘line’ of continuity outside the mind. If distraction confuses or obliterates from the mind the context out of which emerges the material I am now reading, the context can be retrieved by glancing back over the text selectively. Backlooping can be entirely occasional, purely ad hoc. The mind concentrates its own energies on moving ahead because what it backloops into lies quiescent outside itself, always available piecemeal on the inscribed page. In oral discourse, the situation is different. There is nothing to backloop into outside the mind, for the oral utterance has vanished as soon as it is uttered. Hence the mind must move ahead more slowly, keeping close to the focus of attention much of what it has already dealt with. Redundancy, repetition of the just-said, keeps both speaker and hearer surely on the track. Since in a primary oral culture conceptualized knowledge that is not repeated aloud soon vanishes, oral societies must invest great energy, in saying over and over again what has been learned arduously over the ages. This need establishes a highly traditionalist or conservative set of mind that with good reason inhibits intellectual experimentation. Knowledge is hard to come by and precious, and society regards highly those wise old men and women who specialize in conserving it, who know and can tell the stories of the days of old. By storing knowledge outside the mind, writing and, even more, print downgrade the figures of the wise old man and the wise old woman, repeaters of the past, in favor of younger discoverers of something new. itself in equilibrium or homeostasis by sloughing off memories which no longer have present relevance. … Print cultures have invented dictionaries in which the various meanings of a word as it occurs in datable texts can be recorded in formal definitions. Words thus are known to have layers of meaning, many of them quite irrelevant to ordinary present meanings. Dictionaries advertise semantic discrepancies. Oral cultures of course have no dictionaries and few semantic disagreements. The meaning of each word is controlled By what Goody and Watt (1968, p. 29) call ‘direct semantic ratification’, that is, by the real-life situations in which the word is used here and now. The oral mind is uninterested in definitions (Luria 1976, pp. 48-99). Words acquire their meanings only from their always insistent actual habitat, which is not, as in a dictionary, simply other words, but includes also gestures, vocal inflections, facial expression, and the entire human, existential setting in which the real, spoken word always occurs. Word meanings come continuously out of the present … . All conceptual thinking is to a degree abstract. So ‘concrete’ a term as ‘tree’ does not refer simply to a singular ‘concrete’ tree but is an abstraction, drawn out of, away from, individual, sensible actuality; it refers to a concept which is neither this tree nor that tree but can apply to any tree. Each individual object that we style a tree is truly ‘concrete’, simply itself, not ‘abstract’ at all, but the term we apply to the individual object is in itself abstract. Nevertheless, if all conceptual thinking is thus to some degree abstract, some uses of concepts are more abstract than other uses. Oral cultures tend to use concepts in situational, operational frames of reference that are minimally abstract in the sense that they remain close to the living human lifeworld.